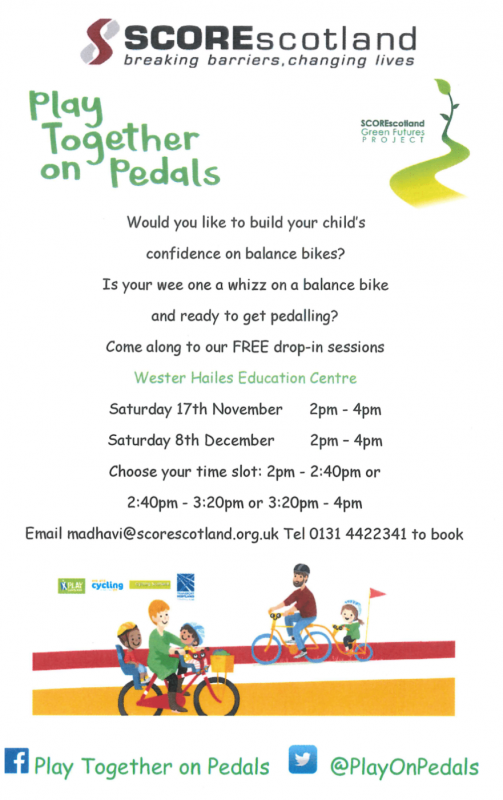 The next session of Play Together on Pedals with SCOREscotland will take place on Saturday 8 December 2018, 2.00pm – 4.00pm. Would you like to build your child’s confidence on balance bikes? Is your wee one a whizz on a balance bike and ready to get pedalling? The free drop-in session will take place at Wester Hailes Education Centre. There will be three time slots: 2.00pm – 2.40pm, 2.40pm – 3.20pm or 3.20pm – 4.00pm. Email madhavi@scorescotland.org.uk or call 0131 442 2341 to book.